Sometime around late 1988, our small group of good friends, most of which I met through McDonald's where we worked, got together for what was my first D&D gaming experience. The other guys had played before and our DM had been running games since the 70's I think. I rolled out my character, learned all the rules, and got to know the Forgotten Realms very well over the course of what turned out to be a campaign that lasted years. Like a lot of gamers, most of the guys had or were getting their characters drawn up by the "local artist" and part time gamer himself. When I handed him my $30 for a color sketch of my new character, I scratched my head afterward and said, "why am I paying this guy to do something I could probably do myself?" Don't get me wrong, he was really good and I think he even ended up doing paintings for some Magic the Gathering cards, but my juices were flowing, I knew I would go broke getting tons of pictures from him, and someone had to buy the Mountain Dew and Nachos. So I sat down with a pencil and paper and a few erasers and gave my character a go. It was the first of many bad sketches for that game and others. 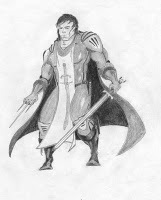 I eventually got better, I added backgrounds, started doing sketches for many of the PC's and NPC's, made a little money on the side and soon became the new "local artist". Although that first finished piece was pretty bad, it was the catalyst for all those artistic seeds, planted throughout my life, to start sprouting and set me on a career course that I'm still following today and probably will for the rest of my life. So, twenty years later almost to the day, I find the unavoidable reminiscing too strong to keep down and I did some digging in the old files. 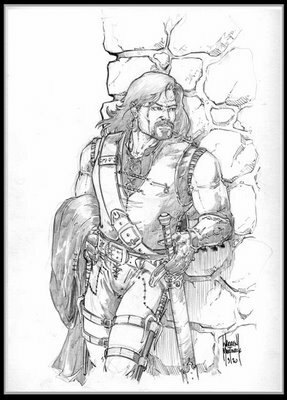 I eventually found that original character drawing, "Dorian Tobias" dated 4/5/89. For ol' times sake and seeing as how it's Friday, I put pencil to paper one more time to give that character another go. Along with a scan of the original here's todays new "Dorian Tobias"
I still talk with some of the guys from the old group and hear about the others from time to time.